Make a Tax-Deductible Contribution to AFLFC Today! 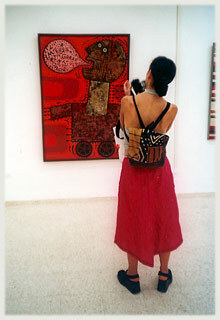 Travel with AFLFC to the 13th Havana Art Biennial! The American Friends of the Ludwig Foundation of Cuba (AFLFC) invites you to explore our website to learn about our mission, events and activities offered in the U.S and Cuba. Our unique partnership with the Ludwig Foundation of Cuba (LFC), a non-governmental, non-profit art and cultural institution in Havana, has enabled us to maintain exclusive ties to the exceptional art community of Cuba. Our annual programs include a number of exciting cultural events, festivals, and curated group trips to Cuba. Given our relationship with the island’s cultural organizations and individual artists, both established and emerging, we offer unparalleled access to the art and culture that makes Cuba so special.